I embrace the end of summer for so many reasons. Living in Los Angeles, I am usually completely done with the heat waves that can last all the way through October. Climate change is real people. Yet, when I start seeing announcements at local grocery stores for Hatch roasting events, it signals to me that the days of unbearable heat are numbered and soon the cool weather of fall will present itself to us. We’ll receive our Hatch chiles from the cool kids at Melissa’s Produce. But, I also love going to the local grocers to smell the toasty aroma of Hatch chiles as they are charring in large roasters. At home, I’ll immediately divide the roasted dark green gems in freezer storage bags. With a Sharpie pen, I’ll mark the date and indicate if they are hot or mild. People will ask about whether or not to remove the skin before freezing. I used to spend hours removing the charred skin from the flaccid peppers. Not anymore. 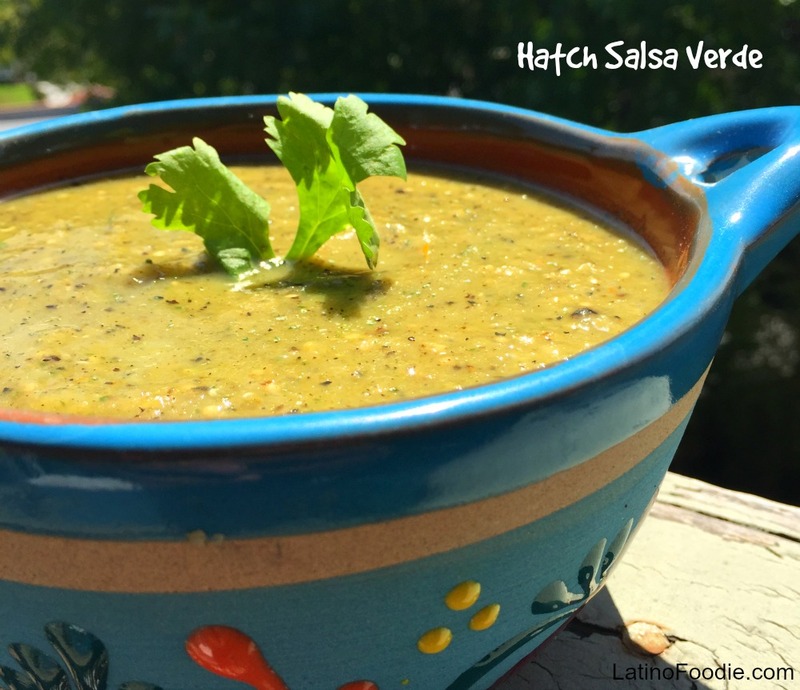 Today, I find myself enjoying the toasty flavors of the charred bits in my salsa verde. It’s really an individual choice. This is a perfect green chile salsa that can be stored and used for many Mexican dishes, including pork and chile verde, green chile enchiladas, green chile chilaquiles (mmmm with a fried egg on top), or simply as a dip with crispy corn tortilla chips. In a large bowl, toss the tomatillos and onions with the olive oil. On a plancha or large heavy skillet on medium-high heat, char the tomatillos and onions until they are fragrant and start to turn brown/black. It takes about one minute on each side. Place the tomatillos, onions, garlic, cilantro, Hatch green chile, lime juice, and kosher salt in a blender. Mix on medium/high to get a chunky salsa. Add a little water to the blender if the salsa is too thick. Taste and add salt (or another hot Hatch chile pepper) to your liking. This looks good! Do you leave the peels on the chiles? Hi Jennifer – No, we roast and then peel the charred skin off of the chiles. I just worked on a big batch tonight. Made some Hatch chile butter and am going to do some Enchiladas Suizas later this week. Can’t wait! YUM! Chris – I used two cloves of garlic, but you can adjust according to your liking. Enjoy! how many tomatillos to make 5 cups? I assume this is cooked and crusshed tomatillos? Hi Farm Mom – I would say about 18-20 medium-sized tomatillos. No, the tomatillos were measured out BEFORE we boiled them and added to the blender.